Traditional Chinese Medicine theory and techniques are used to help wellbeing and lifestyle in order to promote and maintain a reduction of the signs of aging. Acupuncture may be a great tool to counter premature aging, fight wrinkles, sagging skin, dull complexion and many other beauty problems. Whilst at first glance it is a cosmetic treatment underlying health issues would be considered. The reduction of wrinkles as well as beautiful skin and hair is a by-product of a rejuvenated body, which become more resilient to disease, degeneration and aging. The aging process manifests itself within numerous organs. Central nervous system, immune, endocrine, and cardio vascular systems functions may become impaired with age. A course of 10-12 treatments is preferred. Improvement may be measured from around six treatments. Some benefits may be reduction in the depth of wrinkles and of puffiness and bloating on face and around the eyes. Sagging muscles and skin can be tone, improving complexion. Fresher looking skin due to improved circulation, to moisten and hydrate, collagen production that improves skin elasticity and skin tone. Counters acne scarring and scar tissue generally. Special needles and techniques accentuate specific results and reduce the risk of bruising and discomfort for the patient. Regular migraine and headaches need to be treated before facial treatment can be given. Clinical depression and mental illness need to be stable and any red flags must be observed. If patient has severe excess or deficiency it may be inappropriate to commence a full on treatment immediately. Pregnancy, haemophilia would be contra indicated. From TCM Point of view the underlying objective of this treatment is designed to improve the function of organs and balance their relationship with each other in order to improve the circulation of qi, blood and fluids, absorption of nutrients and excretion of waste, so positively improving health. The treatment is not a quick fix. The number and frequency of treatment as well as lifestyle will affect results. Deficiency contributes to a worn looking complexion and a low spirit. Stagnation affects circulation of blood leading to dark spots and fluid retention, dampness. If yang qi is deficient, body is cold and pale skin. Defensive qi leads to hair loss, body appears dry and skin can become cracked. Blood flow is vital for a good complexion to nourish hair, skin, and fingernails. Body fluids prevent dryness. 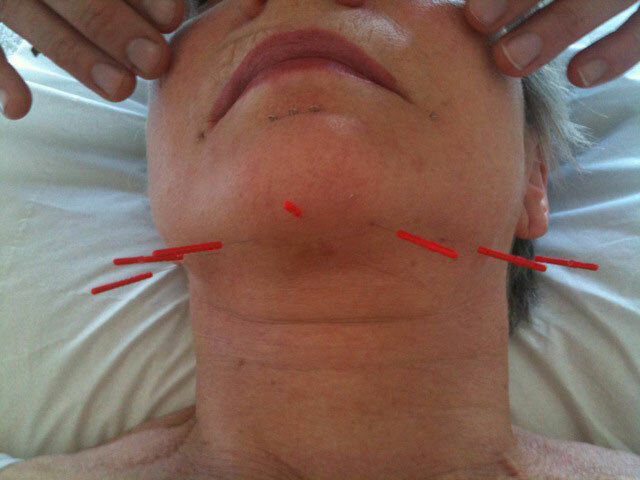 Disruption within the liver will affect the qi and blood flow everywhere, including the face. Gallbladder disharmony will create wrinkles dark spots and a dusty complexion. Kidney regulates the fluid balance of the body, paired with the bladder to extract fluid. Deficiency leads to dark circles and age spots. Heat is considered to be an internal pathogen in TCM signs of this would be swelling, dryness, when present for a while the blood losses its viscosity resulting in broken veins, itchy, dry skin that becomes wrinkled. Often people after treatment report increased feelings of relaxation, improved sleep and feeling of wellbeing.